The City of Gary’s Legacy Foundations Neighborhood Spotlight Miller, Glen Ryan, Gary’s Downtown-Emerson, NWI Hobart, and Griffith will be recognized throughout the region for raising awareness and increasing participation in outdoors adaptive recreational activities. Aging and disability impact everyone. Universal design principles should be considered whenever and wherever possible, for the benefit of each and all. Infrastructure, transportation, and the environment should be considered from conception through execution; programs and services developed and implemented with all in mind. New resources and opportunities typically not seen or not readily available will be introduced to community attendees of different abilities that allow for a fun, creative outdoors experience. Staging will take place primarily at Ralph-Wilco on Miller St. and Grand and ADA Launch at Lagoon and the Douglas Center for Environmental Education on Lake Street. image description: street scene vehicles parked, people walking on sidewalk, one person in wheelchair, colorful kayaks horizontally lined up on grass along with one bicycle nearby. Outdoors Adaptive Escapade (OAE) focuses on highlighting green & blue trails. It celebrates all abilities and showcases the many hidden recreational gems that the Miller community in Gary and neighboring communities have to offer. OAE will feature adaptive vehicles and equipment that will enable individuals with limited mobility to access roads, trails, dunes, and beaches, to participate in activities of all types of terrains and in all kinds of weather. 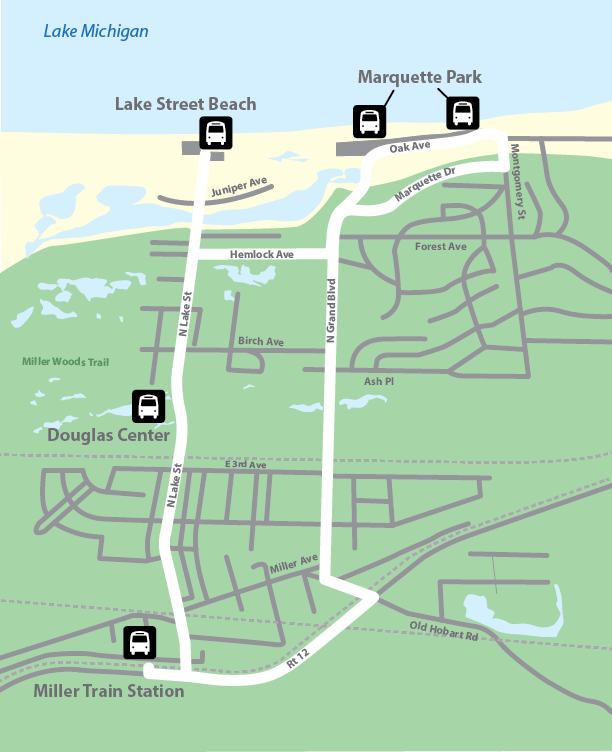 image description: map shows five bus stops, three at lakefront and two within community with borders of Rt. 12, Lake St. and North Grand Avenue. Attendees will have the opportunity to explore and experience a wide range of adaptive outdoor recreation equipment including: accessible paths, vehicles, hand and tandem cycles, Action Trackchairs, and Freedom Trax, kayaks and paddle boards. Zagster Bikeshare and Miller Spotlight’s Take-Bike- the-Streets initiative will be on hand to demonstrate bikes and share information about bike sharing, bike racks, bike repair stations and Build-A-Bike shop initiatives in Gary’s Miller neighborhood. Special training will be provided for blind and low-vision persons interested in kayaking at Marquette Lagoon by Kayak Kenneth. Adaptive bike riding and paddling events will be led by Adaptive Adventures and NWIPA. 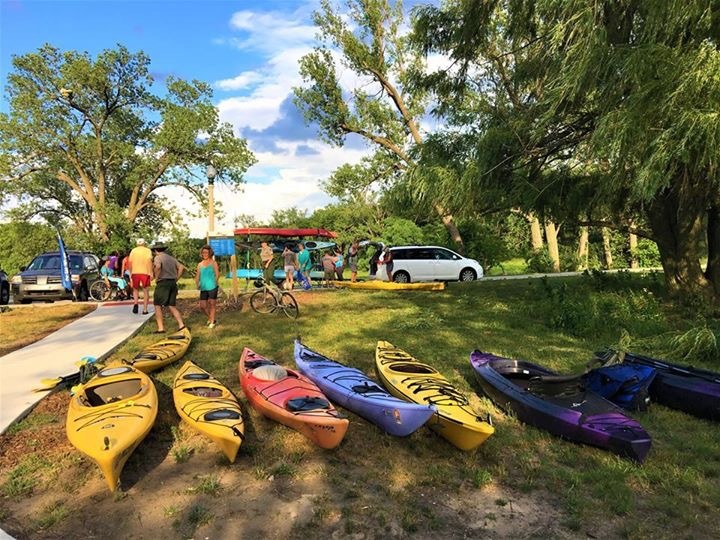 Attendees can also learn about ongoing opportunities including weekly NWIPA’s Sunset Paddle at the ADA Paddling Launch at Marquette Park Lagoon, and the NPS’s kayak/paddle and other water recreation activities hosted on Wednesday’s at Marquette Park Beach and on Fridays at West Beach. The Miller Spotlight group will showcase the initial phases of two accessible community gardens. These gardens will also be a part of the Miller Garden Club’s Secret Garden Walk taking place on the same day. Activities are in coordination with Adaptive Adventures, Northwest Paddling Association (NWIPA), Barrier Free Beach 2020, City of Gary Parks & Recreation, Indiana Dunes National Lakeshore, National Park Services, Save the Dunes, Causes for Change, and City of Gary’s Legacy Foundation Neighborhood Spotlight Groups. Activities will be taking place at various locations along the lakefront. The OAE Expo will be set up at the corner of Miller Avenue and Grand, area referred to as the Old Ralph’s Wilco Grocery Store, Dana Evans Corner, Build-a-Bike area. The Expo will open at 10:00 AM, with an official ribbon cutting celebration at 11:00 AM. Paddling activities take place at Marquette Park, Calumet Lagoon throughout the day. These activities will be held at two launches located near each other. One launch is for persons not requiring any special accommodations, the second launch designed to ADA specifications. Adaptive Adventures, Northwest Indiana Paddling Association and Kayak Kenneth will be overseeing the paddling activities. We invite you to contact us and let us know that you wish to paddle. 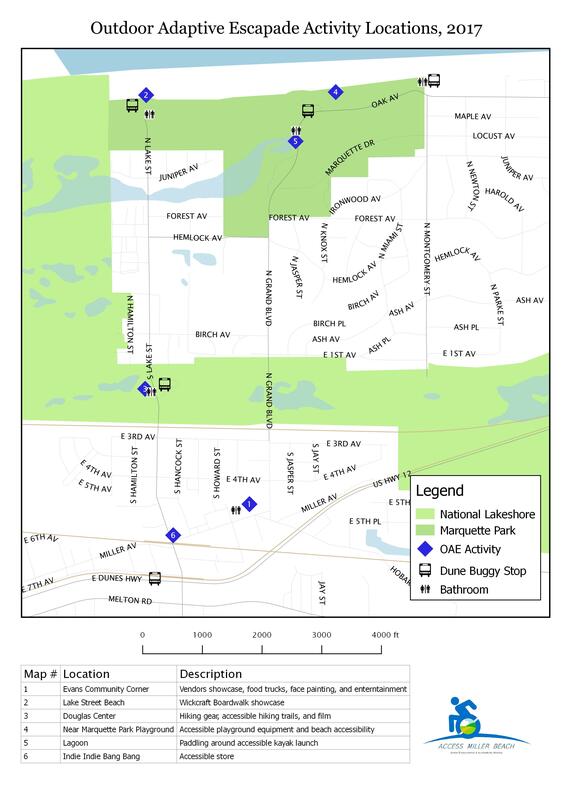 Geocaching will take place around the Lagoon area. You are encouraged to take part in the Scavenger Hunt. Music Entertainment at the Expo location on Grand and Miller will be provided by Garrett Cope and friends. 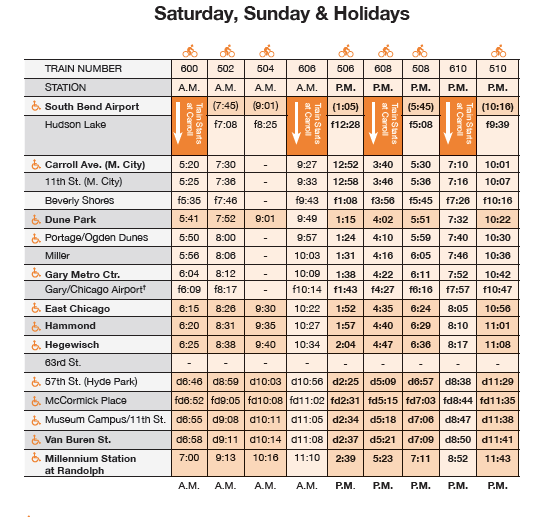 Transportation: Persons from out of area may take the train or drive into the City of Gary. Please see the links below for information. Persons who use wheelchairs who are taking the train into City of Gary, you are asked to get off at the Ogden Dunes Southshore stop, arrangements have been made with Indiana Dunes National Lakeshore to have a small bus known in Miller as the Dune Buggy (no cost to you) to bring you to Miller Beach Community. All other persons may get off at the Miller station and may walk, or get on a Dune Buggy and come to the expo site one of the activity locations. Parking: There is parking available at Marquette Park Lake Street Beach, Aquatorium and at the Concession on Oak and Montgomery. Cost for parking in $5.00 for residents and$7.00 for out of State. You are advised to adhere to parking signs and respect bike paths. Financial donations can be made by clicking the button below or visit www.Causesforchange.org for projects of AccessMiller. 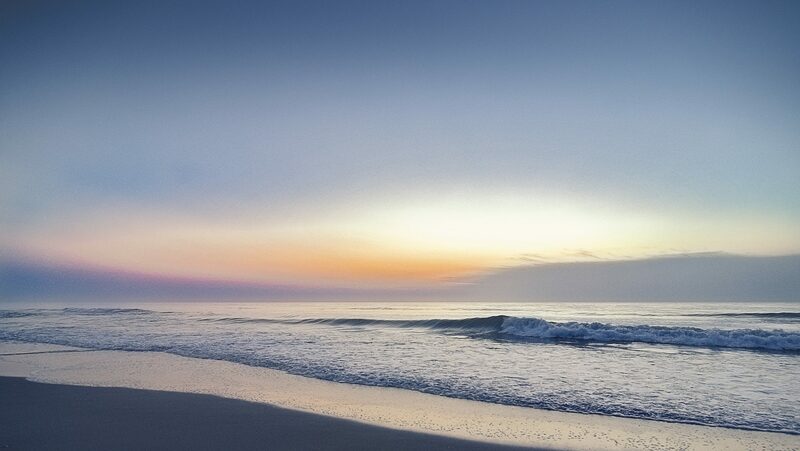 Copyright © 2019 Access Miller Beach. Powered by WordPress. Designed by myThem.es.